I have never been a big fan of fried rice, but I do like just about every other rice-based dish. When I was looking through The China Study All-Star Collection recipe book, I saw this amazingly easy-looking rice-based dish that even had PINEAPPLE in it! I am a major fruit-lover so any recipe using fruits as a central part of the dish will pique my interest. Cook the rice according to package directions. I highly recommend purchasing a nice rice cooker if you don’t have one already. While you wait on the rice to cook, bring the pineapple juice to a boil in a medium-sized saucepan. Simmer the pineapple chunks, carrots, asparagus, and tamari until the veggies are tender but still a little crunchy. How long you let this simmer is completely dependent on how crunchy you want your carrots to be. Check the tenderness every couple of minutes until it reaches your desired tenderness. When I make this, I let it simmer about 6-7 minutes. 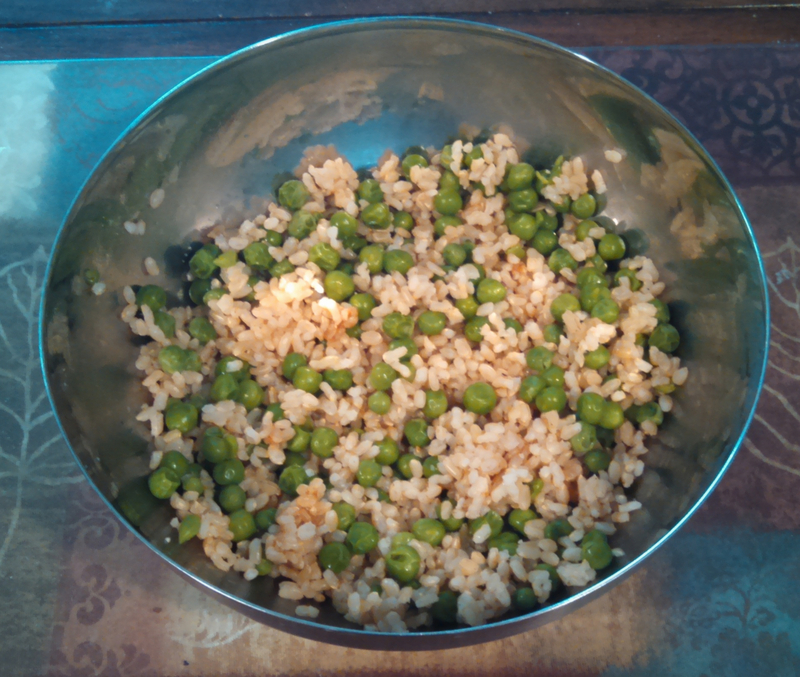 While the rice is cooking and the pineapple mix is simmering, defrost the peas in the microwave. 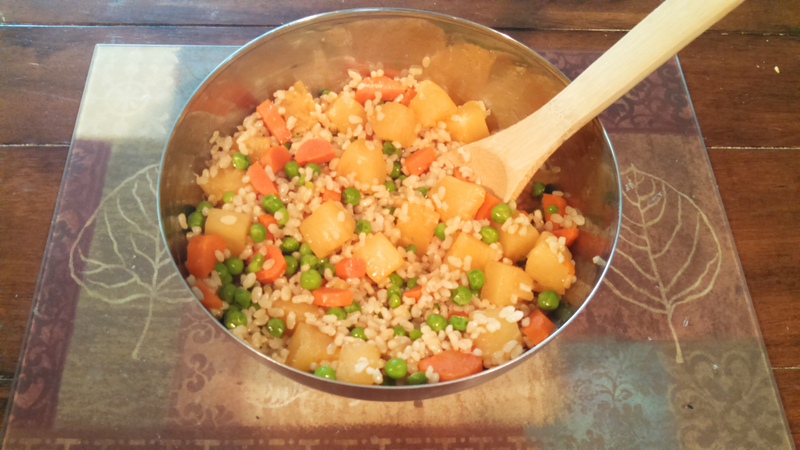 I usually overdo the peas and carrots a bit to make a more veggie-intense version. When the rice and peas are done, mix them in a bowl. When the pineapple mix is done, add that to the rice and peas and mix it all together. I do not recommend dumping the pot into the bowl. There will be a lot of leftover pineapple juice which will make your rice soggy if you dump it all together. Use a slotted spoon to ladle the pineapple mix to the rice bowl and drain excess juice. That’s all there is to it! Enjoy your pineapple “fried” rice!